Kawaii Cute Japanese Beer Ring by SouZouCreations on Etsy. One of many amazing, gravity-defying rings from this seller. 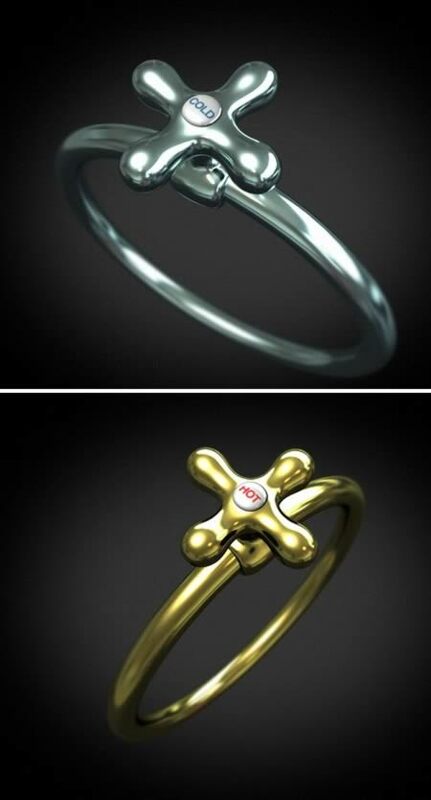 These PYGMY robot rings were developed at Keio University in Japan. 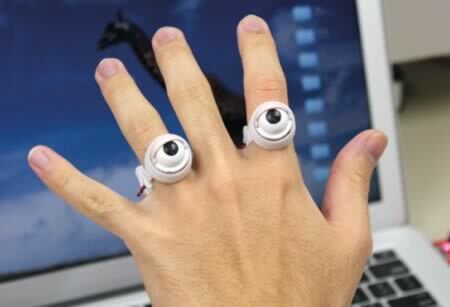 They blink according to different settings, including voice recognition, finger activity and remote control. They are, sadly, not yet on the market. Looking for a slightly weird, very crafty and kinda cute present? Enroll someone you love in the Button Ring of the Month Club. 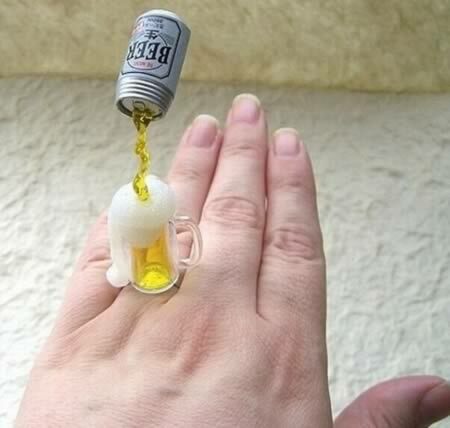 Best of all, the rings are somewhat customized to your personal preferences. Only $55 for a 6 month membership full of accessories galore! As a kid, did you ever have those plastic fingertips that let you pretend you had long, red nails? 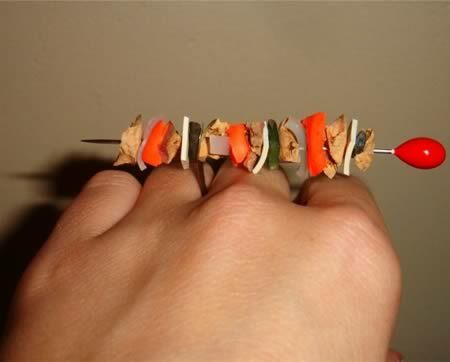 This finger ring by Delfina Delettrez kind of reminds us of that. Except this is the version for rich kids. Or something. 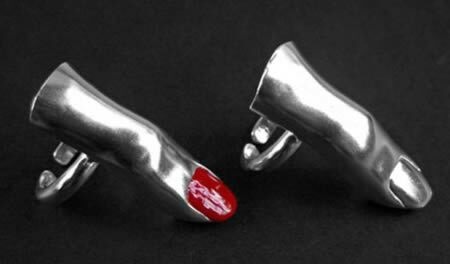 The silver accessory also has a customizable element - it comes with a bottle of nail polish, or you can paint your own color on to the nail. Red! Pink! Glitter! Etsy seller SouZou Creations makes fancy elaborate meals very portable. 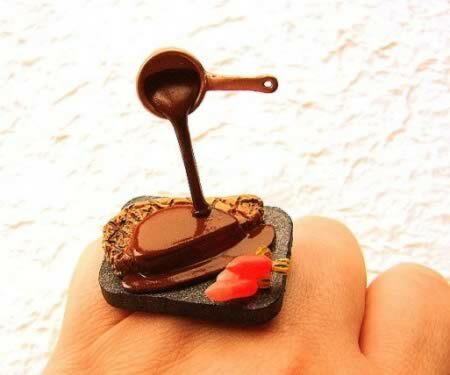 Her tiny polymer clay food sculptures slip right onto your fingers. Several of her works, including this steak platter, include elements that appear to be suspended in midair. Simple and obvious, yet completely brilliant. While they are currently sold out, I hope NAMCO is getting a licensing fee. The company is struggling, and I'd hate to see one of the few remaining old-school game companies go under. Inspired by the iconic video game Space Invaders, this little digital robot is made up of white pixels. It is gold-plated and hand-enameled. 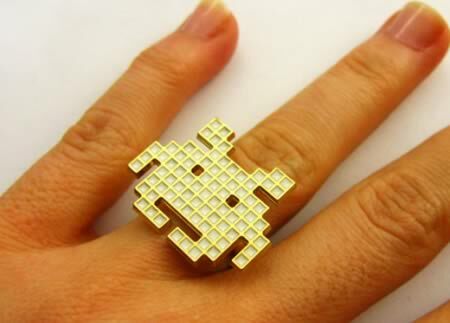 An icon of a generation of gamers, geeks, but also street art fans, this space invader ring will add an edgy and stylish touch to your outfit. This cast metal ring is made of lightweight aluminum with an aged bronze finish. The ring itself is a conversation starter, but when you start showing off the features, that's when you'll become the belle/beau of the steampunk ball. 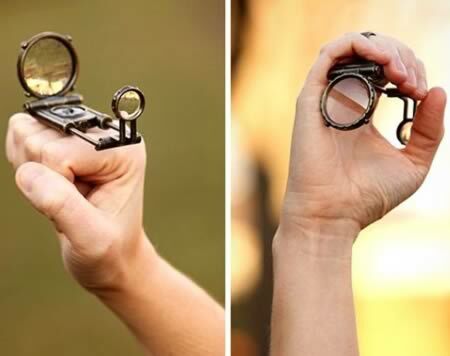 The two lenses fold out and then slide apart, forming a small telescope. Prefer to examine things closer? The large lens doubles as a magnifying glass. This amazing contraption comes in a tin suitable for giving to that person in your life who loves classy gadgets and the color brown. 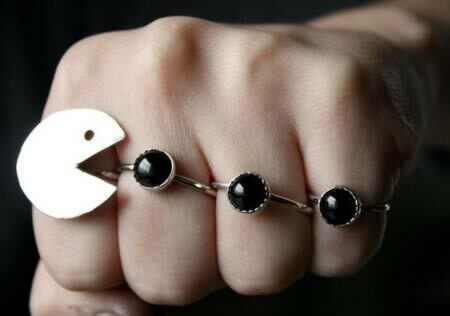 Creative tap ring by Portuguese product designer, Alessandro Beda. What do you prefer, hot or cold?